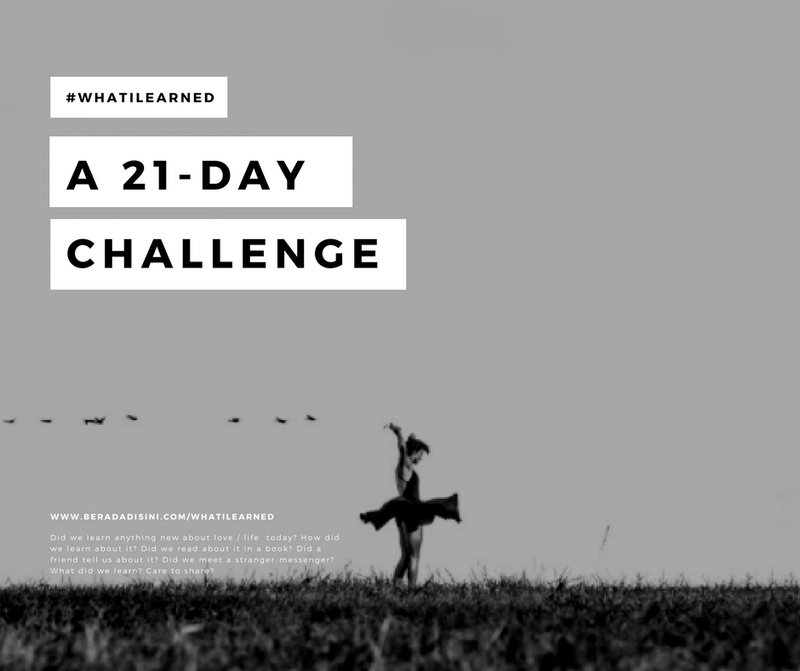 #WhatILearned: Learning A Single Thing About Life, Every Single Day for 21 Days. Day 21. Sun, Mar 12, 2017. >>learned from my Eling class and a conversation with Elda, Suha, and Dera afterwards. There are so many things happening in our lives: memories, emotions, experiences, inspirations–and it’s important to find an outlet to let them all out. We need to express ourselves in ways we found most comfortable, most authentic. Only by expressing ourselves we can finally bloom; only by expressing ourselves we can be empty once again, to receive something new and being full again, and the cycle continues. 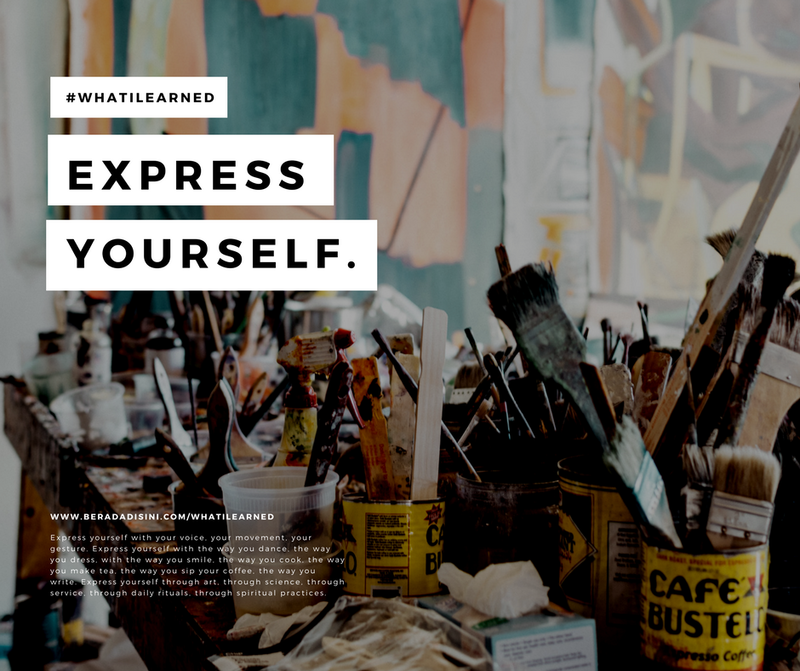 #WhatILearned – Find your own way to express yourself. It should be the expression of self you choose, you love, you enjoy, the expression of self you’re comfortable of taking. Embrace the memories, emotions, experiences, and inspirations in your life, and let them out. Release them when it’s time. Express yourself with your voice, your movement, your gesture. Express yourself with the way you dance, the way you dress, with the way you smile, the way you cook, the way you make tea, the way you sip your coffee, the way you write. Express yourself through art, through science, through service, through daily rituals, through spiritual practices. Let the world see you. Let the world hear you. Just know that someone needs to see you. Someone needs to hear you. Because you, like everyone else that have crossed path with you, are a messenger for one another. Only by expressing yourself you can deliver a message someone else might need to hear. It doesn’t matter if you don’t know what is the message you need to deliver: just deliver it. The person who needs it will always get it. Always. Day 20. Sat, Mar 11, 2017. >>learned from a question in Lingkaran class. Nobody trust ‘the perfect person’. This is simply because humans, naturally, have flaws. We, as humans, have flaws. We have good days and bad days, we have strengths and weaknesses. Some of us are afraid to flaunt our flaws. We are trying to look, be, and sound perfect; sometimes to impress others, sometimes to impress ourselves. #WhatILearned – We are taught to be strong, but we are not taught about how to be vulnerable. Vulnerability is what makes us human, and when we are vulnerable, when we appear as who we are, with our flaws, we can have better & more genuine connection with other people. We are not building walls. We are not pretending. We are not hiding who we really are. We simply appear as the imperfect us. 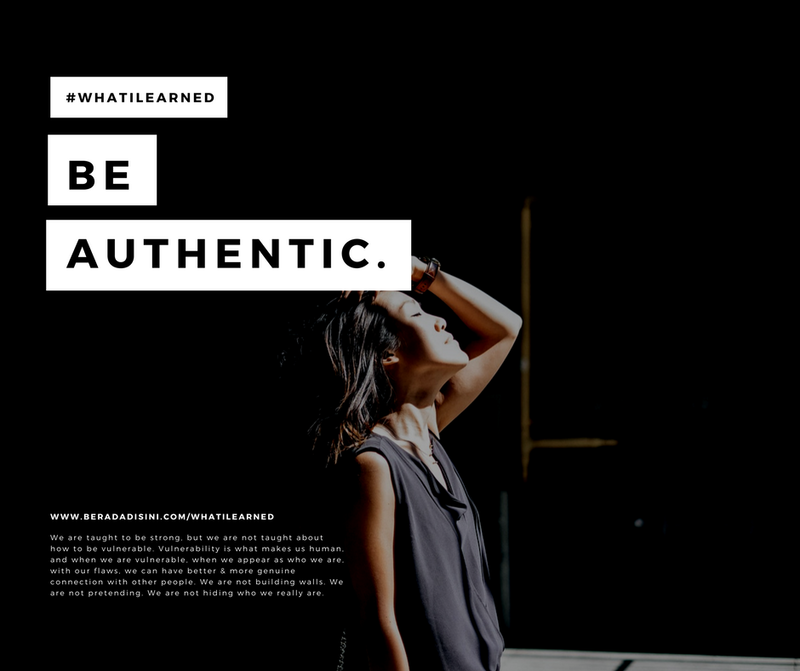 We are being authentic. It’s amazing to see who will stay with us, or will be attracted to us–when we’re being authentic, when we’re being vulnerable: when we are not afraid about showing our flaws, and not afraid about showing our lights. These are the people we want to surround ourselves with. These are the people who likes us despite our flaws. These are the people worth keeping in our lives. Only by being vulnerable can you recognise these genuine people in your life. Day 19. Fri, Mar 10, 2017. >>learned from a memory that came up this morning. There are moments in life when you don’t know what to do, which way to go to, which option to choose. You try to weigh in the pros and the cons, and still don’t know how to react to unexpected things being thrown at your path. 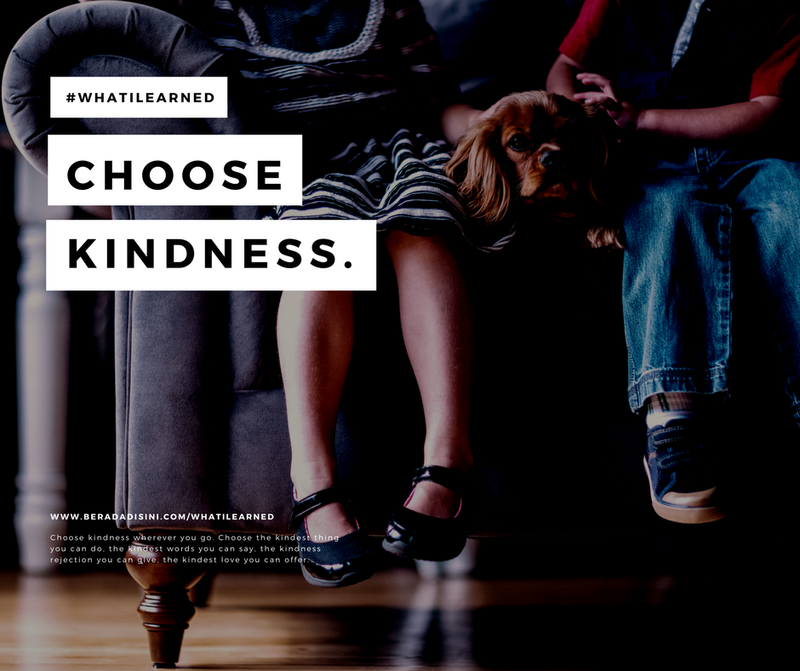 #WhatILearned – When in doubt, choose kindness. What would be the kindest option/reaction for you and for the people around you? If you don’t know what to say, what would be the kindest words you can say? Say that. Or maybe the kindest way is by simply not saying anything? Do that. What is the kindest thing you can do in this situation? Choose to do that. Choose kindness wherever you go. Choose the kindest thing you can do, the kindest words you can say, the kindness rejection you can give, the kindest love you can offer. Day 18. Thu, Mar 9, 2017. Our body is the temple of wisdom, if only we listen to it a little bit better. Our body knows exactly what we need. It knows when we’re tired and sleepy; giving a signal that we need to rest. How many times we ignore it and work overtime instead? Our body knows when we’ve finished being sad, or grieving. A child, who is still very connected with his body, will cry for a while when he gets hurt, and forget everything when his tears have dried up. He’s happy again, content again, he forgets his sadness. We know our body has stopped crying, stop being sad, stop grieving, but we don’t listen to it: we continue to be sad and to grief, we prolong the experience, we indulge ourselves in being sad, in being mad, in being hurt. We remember it still, we carry it still, that even the thought of it makes us feel sad or mad or hurt long after our body has actually finished processing it. 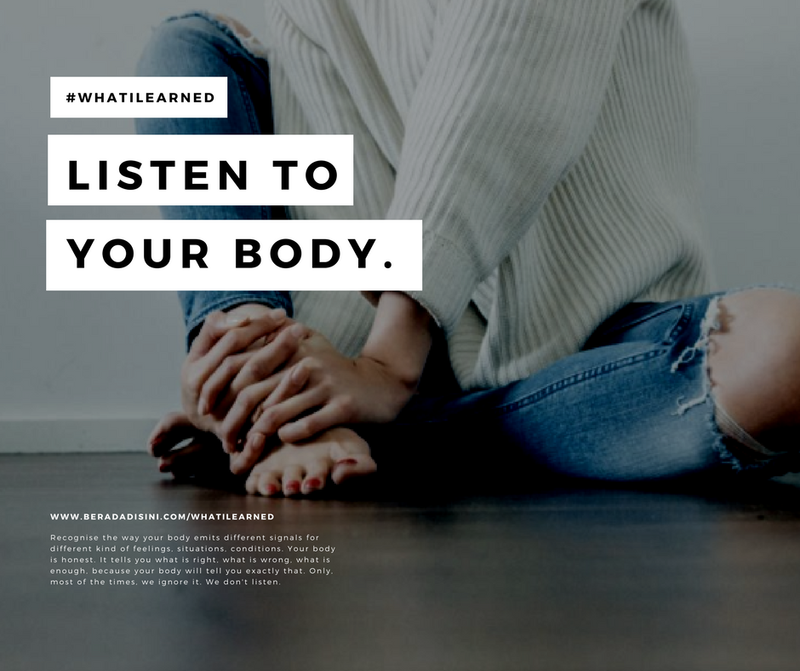 #WhatILearned – Listen to your body a little bit better, a bit more attentively everyday. Your shoulder hurts? Your legs are tired? Your eyes are red and puffy? Your heartbeat becomes irregular? Listen to your body when it is sad. When it is hungry. When it is full. When it is happy. When it is cautious. When it is afraid. When it is excited. Recognise the way your body emits different signals for different kind of feelings, situations, conditions. Your body is honest. It tells you what is right, what is wrong, what is enough, because your body will tell you exactly that. Only, most of the times, we ignore it. We don’t listen. When someone speaks to you and you don’t listen, that person will try to speak louder. If you don’t listen, still, that person will simply stop talking to you. Don’t let your body stop talking to you. Day 17. Wed, Mar 8, 2017. >>learned from reading a passage from Hazrat Inayat Khan. We become who we are now because of what we’ve learned through life. We are the accumulation of the story, the fear, the hope, and the beliefs of many before us. We have learned many things from our parents, our siblings, our friends, our family members, our teachers, our environment, our culture, our religious beliefs. We learn what to love, to fear, to like, to hate, to aspire for, to loathe for based on where we were born, how we were raised, and who rubbed shoulders with us in our lives. We internalised all these things we’ve learned, we’ve taught to, we’ve read from–as our own. As who we are. Is the sum of what we’ve learned define who we really are? 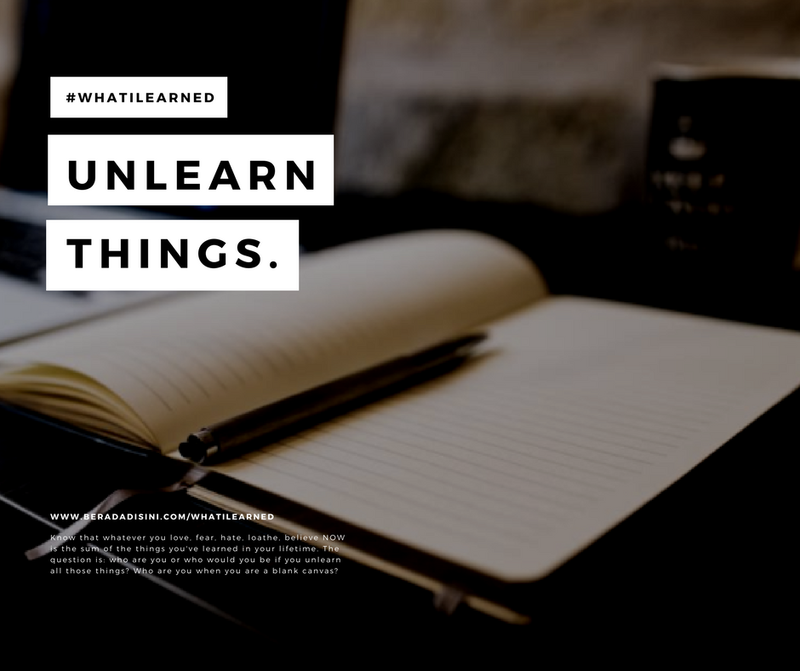 #WhatILearned – Know that whatever you love, fear, hate, loathe, believe NOW is the sum of the things you’ve learned in your lifetime. The question is: who are you or who would you be if you unlearn all those things? Who are you when you are a blank canvas? Do you believe something simply because you are taught or conditioned to believe that–or do YOU really believe that? Are you going to love or hate the same thing if you have never been taught to love or hate those things throughout your life? By keep unlearning what you’ve learned, you might be getting a bit closer to who you really are. Day 16. Tue, Mar 7, 2017. >>learned from listening the talk by John Assaraf. Some people are interested in pursuing their dreams, some others are COMMITTED in pursuing it, and there where lies the difference. When you are committed, you are not only dreaming about your dream, you are not only thinking about it, talking about it, or imagining how good it would be when the dream comes true. When you are committed, you take action. You do what is necessary, you do whatever it takes. 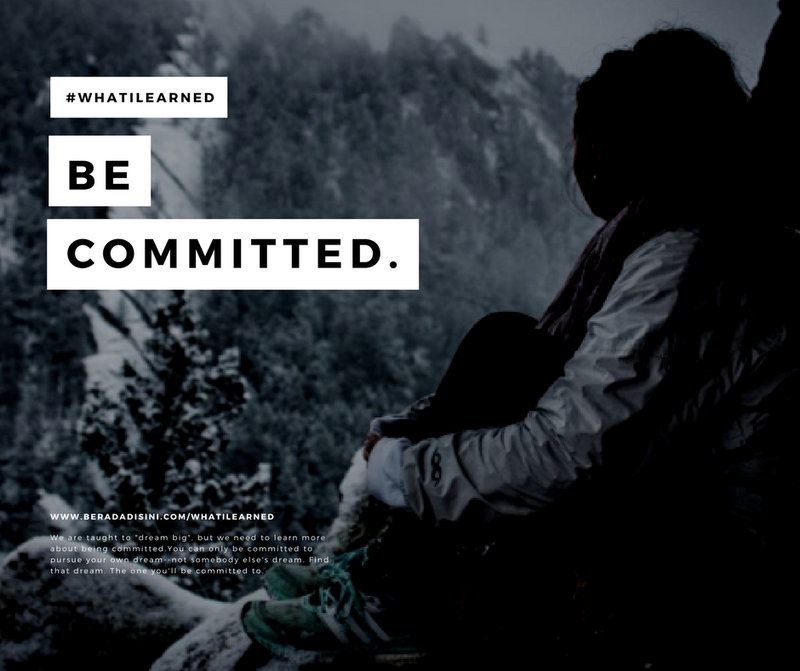 #WhatILearned – We are taught to “dream big”, but we need to learn more about being committed. About having the dream and pursuing it with a certain level of commitment, until it becomes a Great Service. Most of the times, we are interested instead of committed because our dream is not our dream, but the society’s dream. There’s a certain disconnection between what we really want and what we thought we should want. You can only be committed to pursue your own dream–not somebody else’s dream. Find that dream. The one you’ll be committed to. Day 15. Mon, Mar 6, 2017. If we only take what we need, there will be enough resources for everyone. Yes, everyone has different ‘needs’, but no matter how big the need is, it won’t be as big as our ‘wants’. We are taught to take as much as we can, to save as much as we can, and to compete with others in doing so. We learn how to take more than we need, to take more than what we can consume, to take more than what we can give back, to take more than what we can handle. To hoard things, money, so-called friends, knowledge, time, even memories. This is what we called: ‘success’. 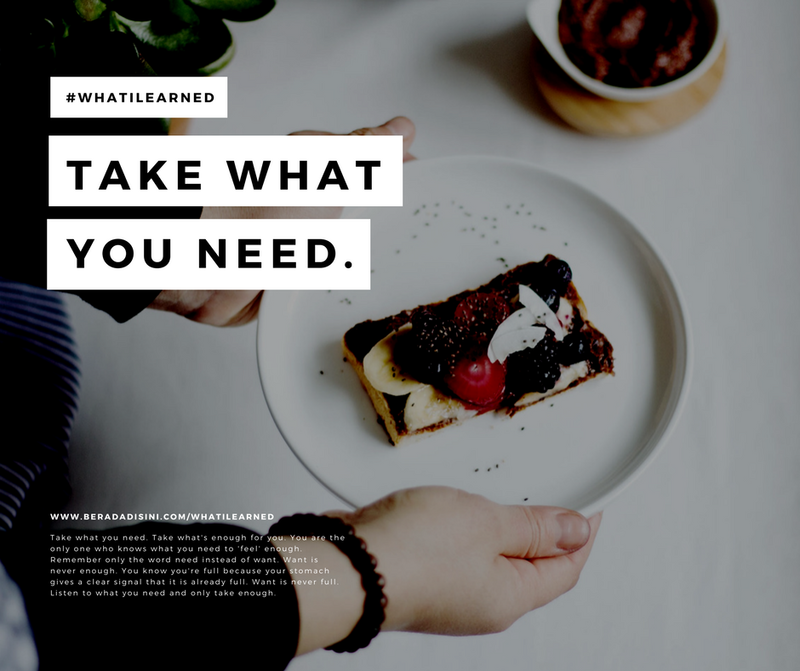 #WhatILearned – Take what you need. Take what’s enough for you. You are the only one who knows what you need to ‘feel’ enough. Remember only the word need instead of want. Want is never enough. You know you’re full because your stomach gives a clear signal that it is already full. Want is never full. Listen to what you need and only take enough. Day 14. Sun, Mar 5, 2017. We are taught to care for others, but we are not taught how to care for ourselves. We are taught how to love, but we are not taught how to be loved. We are taught to help others, but we are not taught how to seek or accept help from others. We are taught how to be happy, but we are not taught how to embrace sadness. 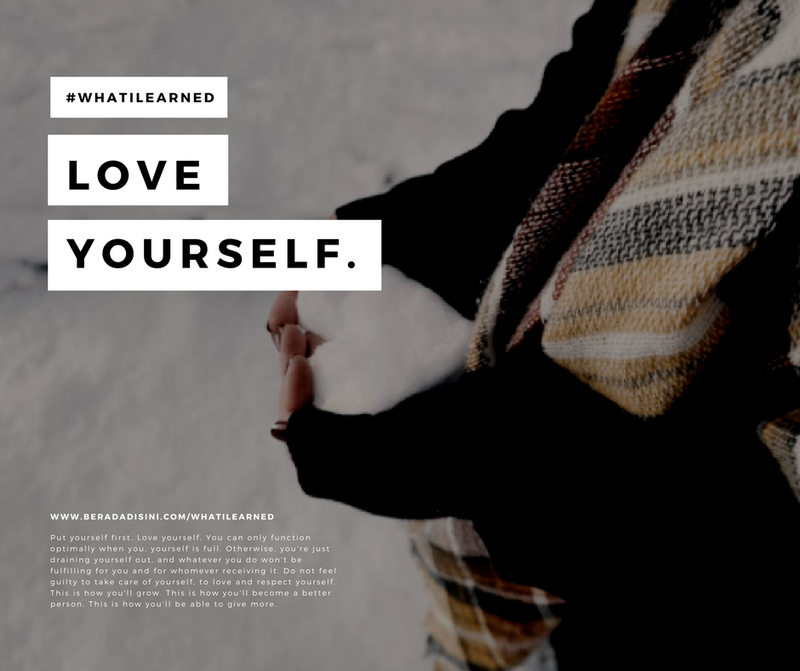 #WhatILearned – Put yourself first. Love yourself. You can only function optimally when you, yourself is full. Otherwise, you’re just draining yourself out, and whatever you do won’t be fulfilling for you and for whomever receiving it. Do not feel guilty to take care of yourself, to love and respect yourself. This is how you’ll grow. This is how you’ll become a better person. This is how you’ll be able to give more. Day 13. Sat, Mar 4, 2017. >>learned from reading a conversation between a mother and her little girl. When we are little, the world is a wonderland. It never cease to excite us. And we are curious. We want to know how everything works. We ask endless questions. We are not easily satisfied with answers. We don’t believe something just like that. We keep wanting to know more, we want to understand more, we want to explore and discover the answer ourselves. Until one day, we stop. We stop questioning. We stop being curious. 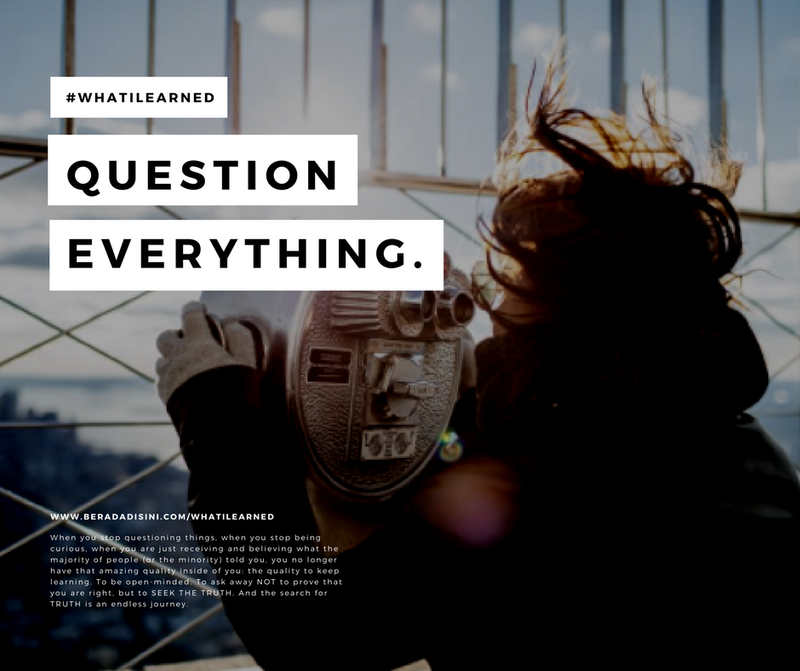 #WhatILearned – When you have stopped questioning everything, be very cautious. When you are no longer curious about the world, be aware of it. When you are satisfied just by listening to an answer, be very wary. One way to stop us from evolving as a human being is by making us stop asking questions (either voluntarily or involuntarily). When you stop questioning things, when you stop being curious, when you are just receiving and believing what the majority of people (or the minority) told you, you no longer have that amazing quality inside of you: the quality to keep learning. To be open-minded. To ask away NOT to prove that you are right, but to SEEK THE TRUTH. And the search for TRUTH is an endless journey. Be curious. Keep seeking your truth. Keep evolving. Day 12. Fri, Mar 3, 2017. When you are your job, when you lose your job, you feel as if you’ve lost yourself. When you are your beauty, when you lose your beauty, you feel as if you’ve lost yourself. When you are your relationship, when you lose that relationship, you feel as if you’ve lost yourself. When you are a mother, when you lose that motherhood, you feel as if you’ve lost yourself. #WhatILearned – The idea is not to put YOURSELF in one basket. Branch out. You can be a mother, a daughter, a manager, a lover, a food lover, a dancer… you can be many things at once, filling different roles at different times of your life. If you have to lose one, you will still have the other, and you don’t have to feel as if you have nothing left. The reason why some of us find it difficult to heal and move on from a broken relationship is because we identify ourselves mostly with THAT relationship. With THAT person. We forgot/neglected our other roles in the world when we were in that relationship, so when the relationship ended, we felt empty. So do not ever say that a certain something or someone is your WORLD, because that is not TRUE. 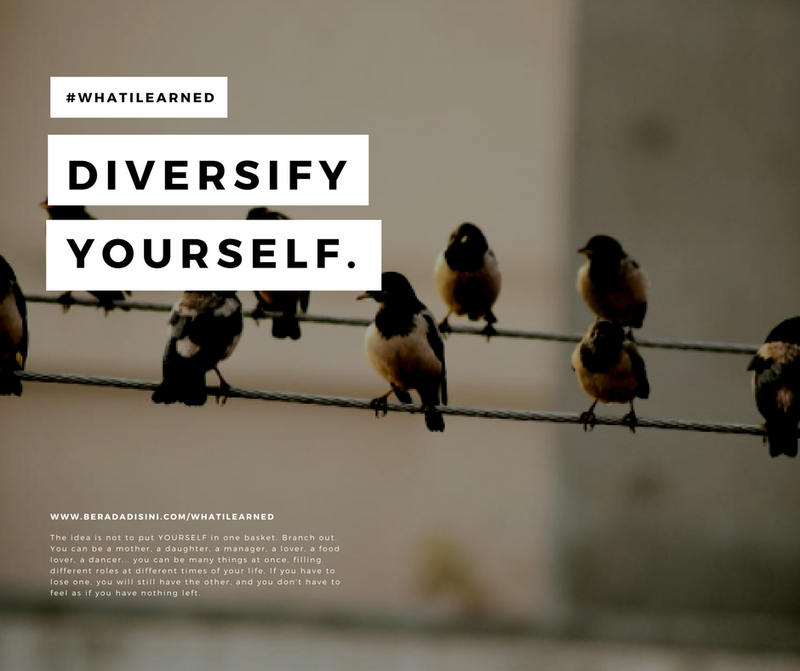 Diversify yourself, serve many roles on earth, and branch out. Day 11. Thu, Mar 2, 2017. I took one bite and chewed. Usually I took another bite. And another bite. And another. The next thing I knew, I was eating. 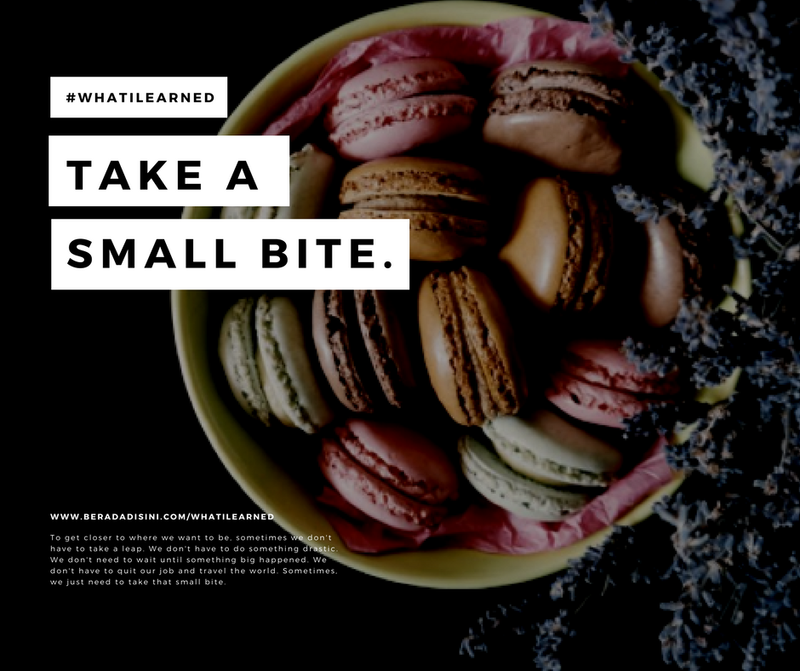 #WhatILearned – In Life, the difficult part is to take that first small bite. Some of us feel as if that small bite doesn’t count. We have big dreams about living our ideal life, passionately. But everyday, we’re doing things that take us farther away from that ideal life we’ve always been dreaming of. We’re trapped in the rat race. We don’t even want take a small bite of the things we’ve always desired. To get closer to where we want to be, sometimes we don’t have to take a leap. We don’t have to do something drastic. We don’t need to wait until something big happened. We don’t have to quit our job and travel the world. Sometimes, we just need to take that small bite. You want to be a writer? Write a paragraph everyday. You want to be a dancer? Join a dance club and dance once a month. You want to be a world’s explorer? Explore the neighbourhood where you live. Just take that small bite. Day 10. Wed, Mar 1, 2017. It takes only 3-5 seconds for humans to realise that they have made a mistake. You regret the time you sent that wrong email, when you accidentally clicked ‘like’ on an ex’s pictures in social media, when you snapped out at your parents or kids then regretted it instantly. Guess what? Those things happened because we didn’t pause. We’re in a hurry and we react instantly to whatever thrown our way. But actually it takes only one deep breath; or 3-5 seconds of pause; to switch our instant reaction to a more conscious one. 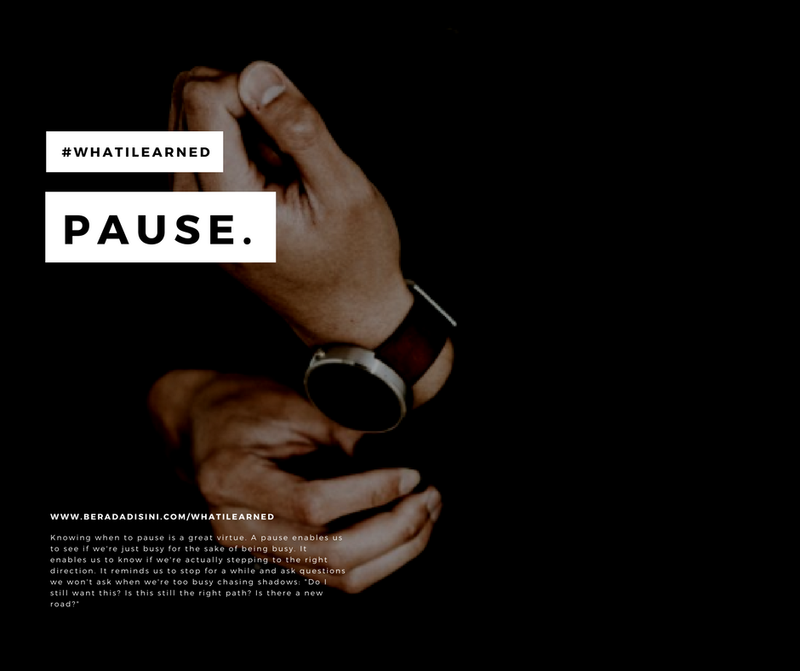 #WhatILearned – Most of the times, we’re too busy getting to where we want to be, we forgot to pause. We race through life, thinking that the faster and the more determined we move, the faster we’ll get there. But keep moving will exhaust us. And when we’re exhausted, we lose our sense of direction. The next time we feel too busy, so in a hurry, about to go crazy from multi-tasking, or too overwhelmed browsing our friend’s newsfeed on social media, take a deep breath. Take a 3-5 seconds pause. Ask yourself why you’re doing this at the first place. What is it that you’re chasing? Day 9. Tue, Feb 28, 2017. It’s OK to Be Not OK. Seek Help. But the truth is, there are moments in life when we are not fine, we are not good, and we are not okay. At these moments, we feel utterly alone when we can’t tell anyone about how we feel, about what we’re struggling with. We are afraid. We are afraid to tell anyone because we fear their judgements. This fear, unfortunately, is quite valid. #WhatILearned – No matter what we do in life, we will always have people judging us. The idea is not about avoiding these judgements, but simply about not giving a damn. Put ourselves first. Save ourselves first. Love and respect ourselves first. Know that you will always have kind people around you; even strangers. Know that you are not alone, that you can always reach out for help. And asking for help is not a sign of weakness. On the contrary, it’s the sign of strength. Because by asking for help, you have defeated not only your fear, but also your ego. 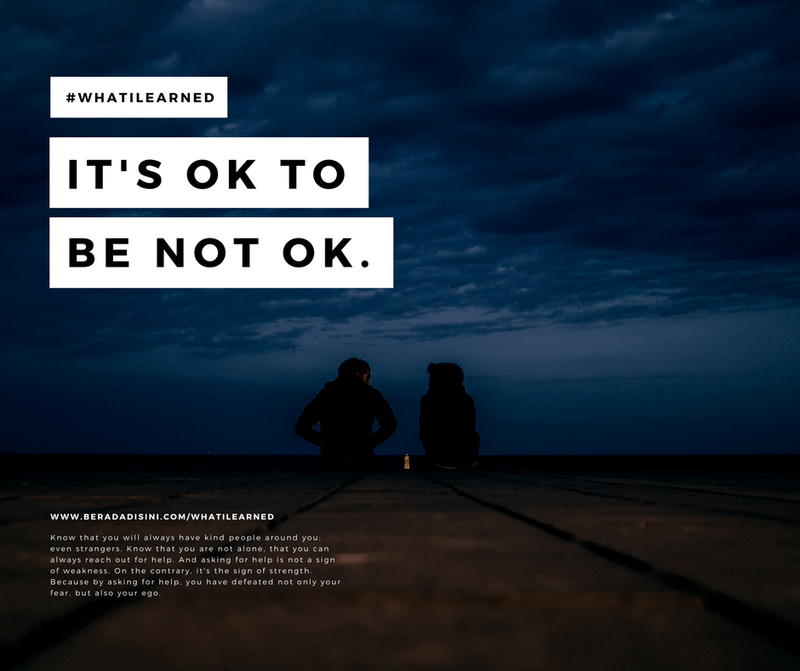 Know that it’s OK to be not OK because we were, are, and will be THERE at some points in our lives. It’s OK not to be perfect and in control all the times. It’s OK to be vulnerable. It’s OK to be honest. It’s OK to be you. Day 8. Mon, Feb 27, 2017. Let Go of Any Expectations. Expectations Lead to Disappointments. One of the reasons why we’re stressed out is because we have THIS expectation about Life, and we’re worrying about how we can meet THAT expectation. When the expectation is not met, we’re stressed out even more: we feel like we’re not good enough, like we’re a failure. When you’re doing something without worrying about the results, you would find that you’ll be able to do it without a weight on your shoulder. No matter how meticulous we have planned for things, something can always go wrong, something can always slips through the cracks. How comfortable are we with knowing that no matter how hard we try, end results can never be guaranteed? We have no control over the results that we’re getting. We only have control over what we do, what we put out to the world. 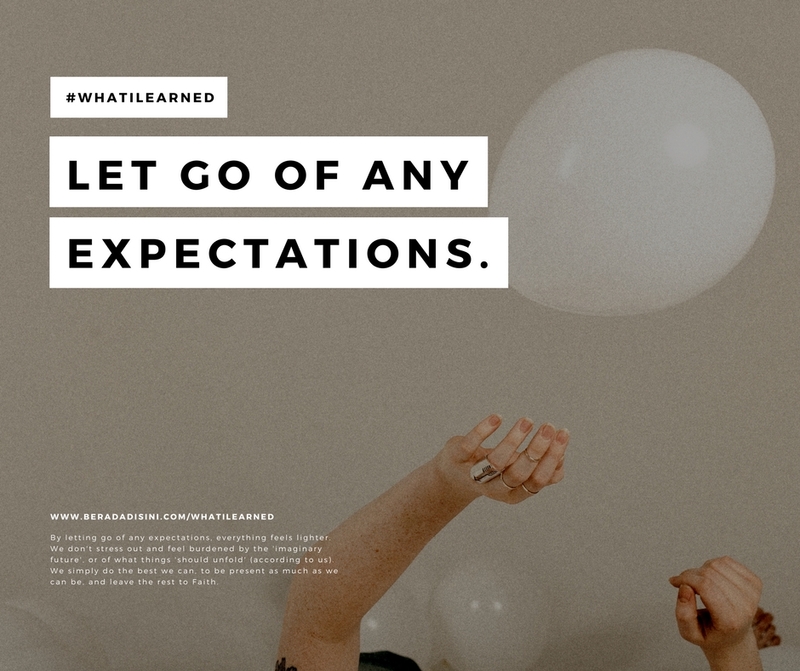 #WhatILearned – When we let go of any expectations, we only concentrate in giving our best at a given moment. This is something we can control. We know how to give our best, and we can give our best when we want to. By letting go of any expectations, everything feels lighter. We don’t stress out and feel burdened by the ‘imaginary future’, or of what things ‘should unfold’ (according to us). We simply do the best we can, to be present as much as we can be, and leave the rest to Faith. Day 7. Sun, Feb 26, 2017. There are so many things you can do in life, and it is exactly for this reason that we need to manage our energy. Pay attention to the way we spend our time, the people we hang out with, the kind of information we consume, the kind of entertainment we enjoy, the kind of thoughts we have, the kind of food we take in. Have we been managing our energy well? Do we conserve our energy to do things that excite us? That makes us grow? That makes us feel happy, fulfilled, and productive? Do we conserve our energy to meet people we like, people we respect, people we admire… those who inspire us to be the best version of ourselves? Where do we channel most of our energy? 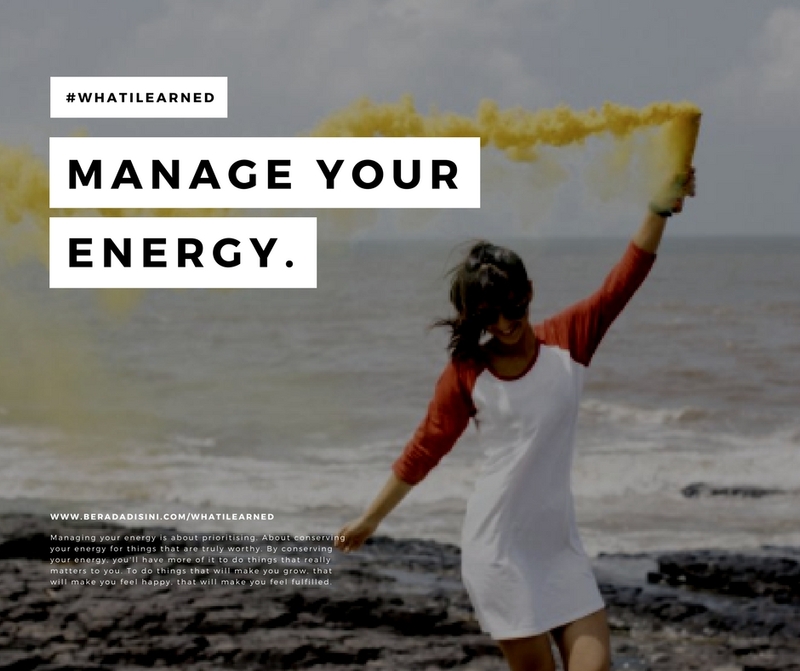 #WhatILearned – It’s important to track the way we channel our energy in a day, to know whether we have managed it well. Which activities power us up, and which activities drags our energy level down? Which people makes us feel inspired and energised and which one makes us feel tired and drained? After hours of binge-watching, binge-eating, or binge-scrolling our social media feed, do we feel more energised, or less energised? When do we feel tired for something we found truly fulfilling? When do we feel tired for something we would later regret? Managing your energy is about prioritising. About conserving your energy for things that are truly worthy. By conserving your energy, you’ll have more of it to do things that really matters to you. To do things that will make you grow, that will make you feel happy, that will make you feel fulfilled. Day 6. Sat, Feb 25, 2017. A habit is created by doing certain things repetitively, consistently, until it becomes something you do automatically. Somethings feels wrong when you’re not doing it. However, there are certain things that might come up during this habit-development process; and you can’t really keep a clean streak. I missed my daily lesson update yesterday because had a full day and then I met a friend until quite late at night; and when I got home the Internet wasn’t working. Does it mean I need to give up my 21-Day Challenge just because I cannot keep a clean streak? Well, no. I decided to make up for it. #WhatILearned – In life, sh** happens, we make mistakes, or we do things we would later regret. But does it mean we have to stop and give up? Of course not. We can always make up for it. So don’t be burdened by setbacks. Just understand that sometimes you can’t have things your way–even if you really like to. The only thing you can do is to realise this, and then push yourself to go back to the right track. Instead of giving it up altogether, just because you cannot have a clean streak, or because you cannot have it ‘perfect’, just know that you can always make up for it. It’s all good. Day 5. Fri, Feb 24, 2017. Befriend Life. (Well, Otherwise, It Would Be Miserable). How would you treat Life if Life is, indeed, a good friend? Would you change the way you accept it, interact with it, experience it? A good friend is not perfect. Sometimes, he/she will do something that hurts our feelings. And such is Life. Sometimes we experience Life for being imperfect. Plans doesn’t manifest, love wilts, mishaps happens… and of course we can find so many things that are wrong about Life. But we can also find so many things that are RIGHT about it. Like a good friend, we know that Life is always there for us. It has given us so many things we sometimes forget to be grateful of. But Life never mentioned it. Life doesn’t count tally. We does. We said, why Life is unfair? Why Life throws us things we do not want, we do not like, we do not expect? Often times, we counted what’s wrong with Life, but we missed counting what’s right. 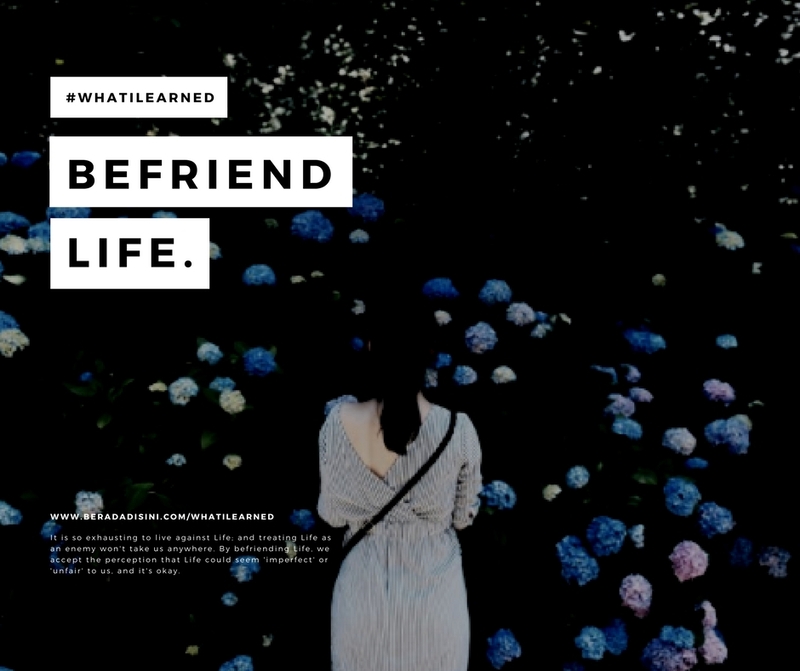 #WhatILearned – When we befriend Life and treat it as a good friend, even when Life throws something our way that we do not want, do not like, do not prefer, or do not expect, we would respond to it in a friendly manner. We might want to kindly ask Life about it: why do you give me this? What would you want me to learn from this? What is the message you’d like me to hear? It is so exhausting to live against Life; and treating Life as an enemy won’t take us anywhere. By befriending Life, we accept our perception that Life could seem ‘imperfect’ or ‘unfair’ to us sometimes, and that it’s okay. It’s okay. Day 4. Thu, Feb 23, 2017. >> learned from a meeting with WritingTable, IWasHereID, and IbuPenyu. We have been taught to compete. Our education system in general has been motivating us to compete with one another. We are applauded for being competitive. At the end of the day, it burdens us as we launch into adulthood. If she can do that, I can do that, too! If she has that, I can have that, too! If she becomes that, I can become that, too! Life has become a journey of I-am-better-than-you and an I-can-do/have/be-that-too race, leaving us feeling (ironically) defeated and exhausted. It’s too overwhelming to have to be good in almost everything. We forget the fact that it’s okay for us not to be good in something, because someone else might be good in that thing, and we can compete collaborate with them. We are ashamed to say I cannot do that, I cannot have that, or I cannot become that because we’re afraid that this will make us look weak, or lazy, or stupid. We end up with a burnout. Just because we can, doesn’t mean we have to. When yes has become a burden, say no. 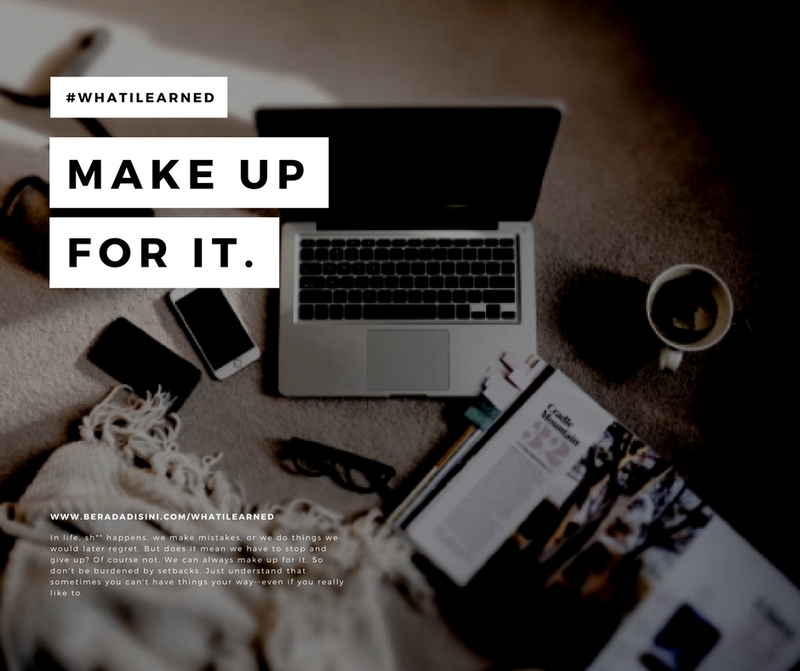 #WhatILearned – They key to stay sane and to execute things is to know that you can’t do it all. You need to collaborate. Choose a part that would make you feel happy, energetic, light, and fulfilled, then find some friends, partners, or confidants who are good in doing the things you’re not good at (or not happy to deal with). Make sure that these friends, partners, and confidants share the same vision + integrity with you. And then, trust them. Trust them to launch this vision + idea into the world, together. 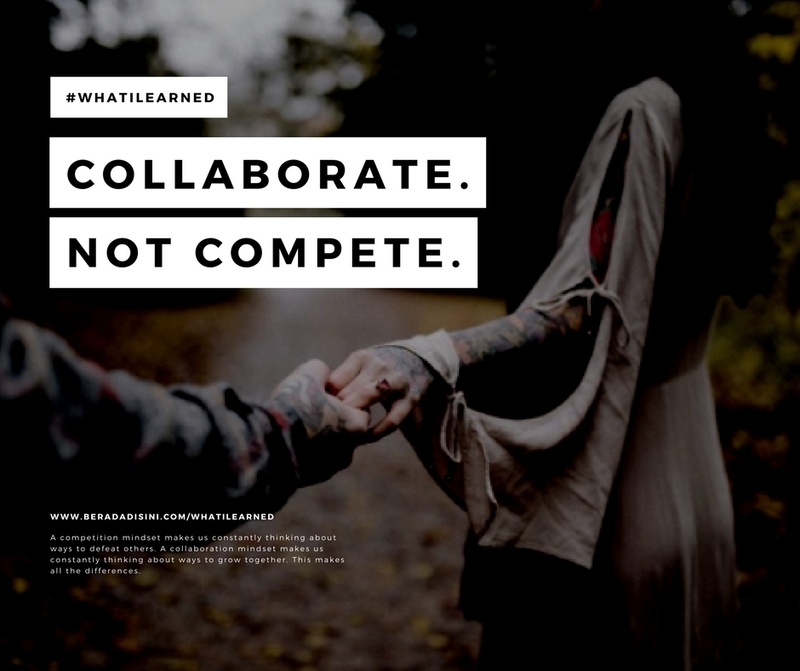 Collaborate, instead of compete. Re-learn how to collaborate by acknowledging the fact that just because you can do everything by yourself, doesn’t mean that you HAVE TO. You can share the weight and responsibilities, you can combine strengths, you can accelerate things and expand further; simply by doing things together, instead of doing it alone. A competition mindset makes us constantly thinking about ways to defeat others. A collaboration mindset makes us constantly thinking about ways to grow together. This makes all the difference. Day 3. Wed, Feb 22, 2017. Don’t Try. Just Do. Act. Commit. Create. Be. >> learned from hearing the audio recording of the channelling of Bashar by Darryl Anka. How many times do we say: I’ll try to do that. I’ll try my best. I’ll try to come. By trying, you’re not living in the present, in the now. By constantly trying, you’re living in the future. In the present, now, in this particular moment, you can’t try. Right now, you can only say that you’re doing it or not doing it. 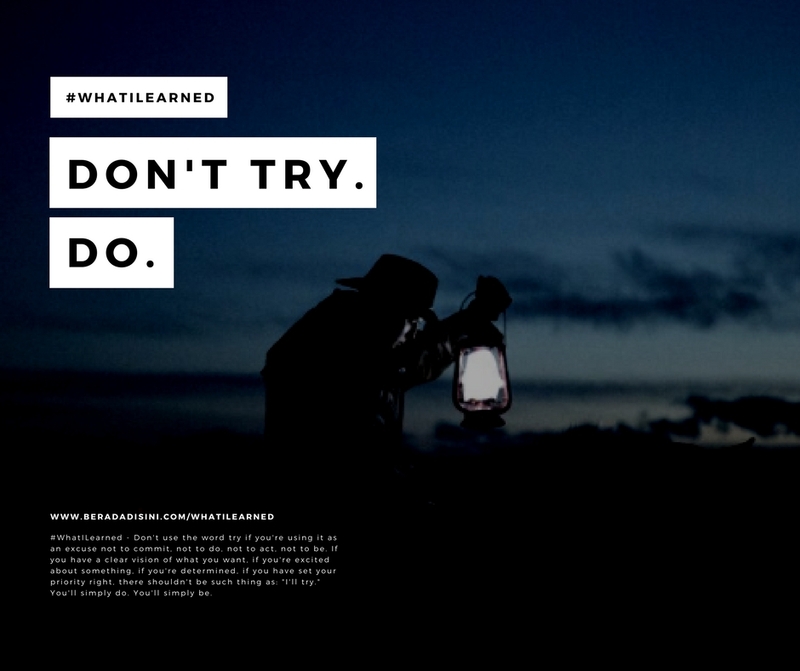 #WhatILearned – Don’t use the word try if you’re using it as an excuse not to commit, not to do, not to act, not to be. Stop trying. Start doing. Start being. Either you do it, or you don’t. You don’t try to write more often. You write more often. You don’t try to attend that meeting. You attend that meeting. You don’t try to be more adventurous. You become more adventurous. You don’t try to be an artist. You become an artist. You don’t try to stop smoking. You stop smoking. If you have a clear vision of what you want, if you’re excited about something, if you’re determined, if you have set your priority right, there shouldn’t be such thing as: “I’ll try.” You’ll simply do. You’ll simply be. Day 2. Tue, Feb 21, 2017. Befriend Fear. Try to Recognise Which Fear Lets You Grow: the Fear That Expands You. Hebrew Bible uses two different words for fear. The first one is Pachad. Pachad is ‘fear of projected or imagined things’. When fear stems from the overreactive & the irrational, when it stems from worries about what could happen, or the worst-case scenario, we’re experiencing Pachad. The second one is Yirah. Yirah is a kind of ‘fear’ we feel when we: 1) inhabit a larger space than we are used to; 2) suddenly possess considerably more energy – or power, or knowledge – than we had before; 3) feel the presence of the divine. 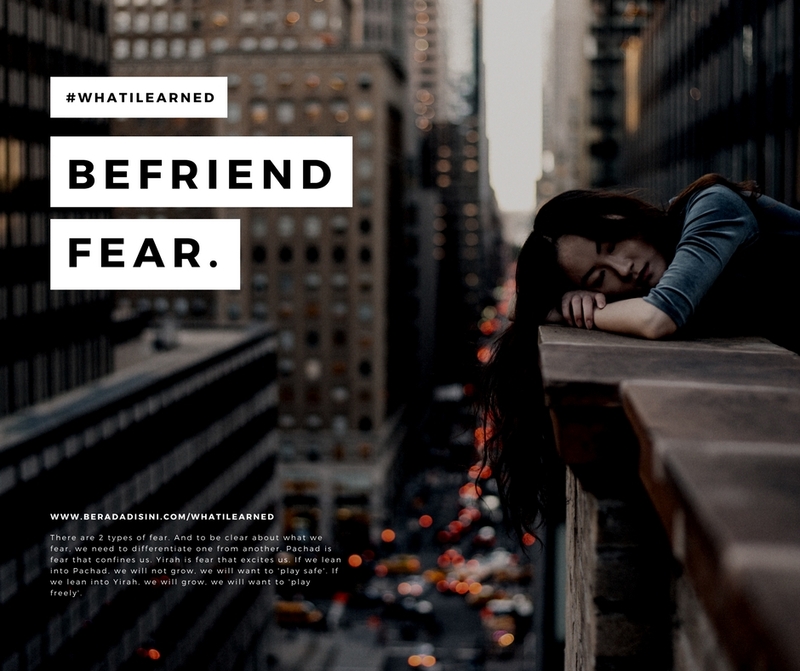 #WhatILearned – There are 2 types of fear. And to be clear about what we fear, we need to differentiate one from another. Pachad is fear that confines us. Yirah is fear that excites us. If we lean into Pachad, we will not grow, we will want to ‘play safe’. If we lean into Yirah, we will grow, we will expand, we will want to ‘play big’. We experience both feelings as fear. But Pachad is when we fear the Darkness inside of us, and Yirah is when we fear the Light inside of us. Yes. Some (parts) of us are afraid to let our true self SHINE freely and brightly. Some of us are afraid to share our gifts, our messages, our visions, our inspirations to the world. Leaning into Yirah enables us to grow and expand. It’s the ‘fear’ we feel we’re about to start a new semester, when we’re about to graduate from high school and enter university, when we’re about to be given a bigger role/responsibility, when we’re about to leap out of our comfort zone, when we’re about to ‘play big’. Don’t be afraid to let your Light shine. By not sharing your gift & your message to the world, you might deny someone else’s rights to receive the gift they need to receive and to hear the message they need to hear. Just shine. Bright. #1. Mon, Feb 20, 2017. ‘Insure’ Your Health. Invest in Your Happiness. Know That You Are Enough. 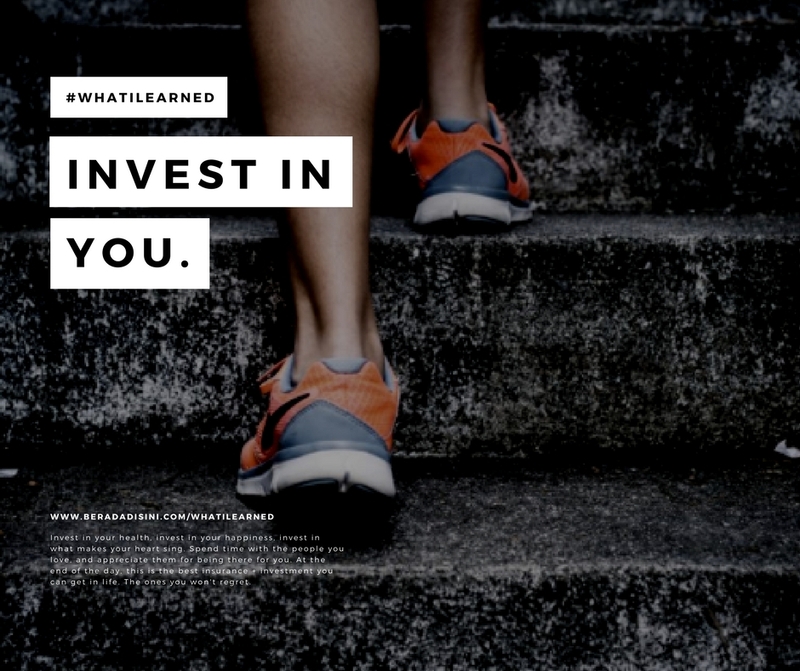 Do you insure + invest in your health? When you get this question, most of the times you’re thinking about health insurance or other safety net. My friend, an ex-banker and financial educator, told me that she does invest in her health–NOT by buying insurance policies, but by going to the gym and working out, eating good + healthy food, committing herself in good + healthy habits, not stressing out, enjoying quality time with her loved ones, not trying too hard just to please others, and avoiding unnecessary stress. THIS is her investment in her health. She makes sure that she is happy. She learns how to feel enough just by being herself and by whatever (or whomever) she has. #WhatILearned – Some of us thought that we can ‘buy’ things to make us feel ‘safe’. We buy health insurance ‘in case we fell sick one day’. Nothing wrong with this, really, as long as we remember that just because a safety net is there, it doesn’t mean that we have to risk ourselves to fall. Invest in your health, invest in your happiness, invest in what makes your heart sing. Spend time with the people you love, and appreciate them for being there for you. At the end of the day, this is the best insurance + investment you can get in life. The ones you won’t regret.